HARTFORD, Conn.—Socialist Action held its 14th national convention here over the weekend of Feb. 25-27. Delegates and observers at the enthusiastic gathering were greatly buoyed by the recent mass ursurge in the Middle East, Europe—and the United States. Adam Ritscher, a Socialist Action member and Steelworkers union activist from Superior, Wisconsin, underlined the links between the struggles in this country and abroad when he addressed a Saturday night public rally at the convention site. “What began in the streets of North Africa,” Ritscher said, “has now spread to the Middle West. U.S. capitalism’s globe-trotting chickens have finally come home to roost. “In many ways Egypt was the spark that ignited the dry, brittle grass of working-class discontent that has now started a raging fire and has come to engulf even the distant pasture lands of Wisconsin. Other speakers at the rally included Glen Ford, Black Agenda Report and Black is Back coalition; Blanca Misse, Student Workers Action Team (University of California, Berkeley); Nellie Bailey, Harlem Tenants Council, Black is Back Coalition; Socialist Action National Secretary Jeff Mackler; Marilyn Levin, Boston United for Justice with Peace, co-coordinator, United National Antiwar Committee; and Socialist Action (Canada) Federal Secretary Barry Weisleder (all organizations listed for identification only). The meeting also received greetings via an international telecom hook-up from Vangelis Koutalis of OKDE/Spartakos, Greek section of the 4th International. The convention capped a three-month written and oral discussion concerning the organization’s perspectives and key tasks. The discussion was open to participation by all Socialist Action members. Each branch then elected delegates to the convention, whose job it was to consider, debate, and approve Socialist Action’s policies for the coming period. At the convention, in addition to the overall Political Report given by Adam Shils, reports were delivered on international perspectives (Gerry Foley), antiwar movement (Christine Marie), immigrant rights (Lisa Luinenburg), the revolt in the Middle East and North Africa (Andrew Pollack), Fourth International (Jeff Mackler), and organizing Socialist Action (Daniel Adam). In his Political Report, Adam Shils described how the ruling-class campaign for “austerity” has moved to the center of U.S. politics. In order to maximize their profits, employers—and the governmental apparatus that they control—are attempting to shift the burden of the economic crisis more and more onto the backs of the workers. Their measures include lowering wages, benefits, and pensions; greater use of temporary and part-time workers; speeding up the job while lowering safety and health conditions; cutting back on state and federal social spending; and reducing taxes and regulations (such as environmental standards) that impinge on the privileges of the ruling class. At the same time, the Obama administration has undertaken heightened repressive measures, expanding its targets from people in the Muslim and Arab-American immigrant community to activists in the antiwar movement. A major purpose of the administration’s scapegoating attacks and its rollback of civil liberties, Shils said, has been to provide renewed impetus to the U.S. “war on terror” and its wars abroad. Shils highlighted the working-class mobilization against the Wisconsin state government’s plans to break the public workers’ unions. He noted that the fightback against these measures quickly grew to a size and level of militancy that has been unprecedented in recent decades, and that it had gained vast support in solidarity demonstrations across the country. He cautioned, however, that the Wisconsin struggle was vulnerable to betrayal by the top labor officials and the Democratic Party. Indeed, the bureaucratic officialdom had already begun to offer concessions while the mobilization was still at its peak. The misery caused by the current crisis of the capitalist system, Foley said, can open the gates for worldwide upsurges by the working class and oppressed masses. But history shows that the window of success for these struggles can be very short lasting; if the movement fails to take rapid and decisive measures to deal with the crisis, it can be defeated. He pointed out that the democratic demands of the masses in the Middle East can be fully achieved only by breaking with the current economic and social system and building a movement for socialism. But despite the formation of popular committees of administration and armed struggle in those countries—especially in Libya—there is no immediate guarantee that the working class will be able to take overall leadership of the new movements and governments. This could lead to demoralization among the forces in struggle in the Middle East. Foley also noted that economic inequality has been growing quickly in China—which has become a potential powder keg. He said that Socialist Action does not see the recent economic reforms in Cuba, which rely on limited market mechanisms, as reflecting a major orientation to the restoration of capitalism by the Cuban leadership. While there is always a danger that such measures could foster individualism in conflict with socialist principles, the establishment of new, privatized small concerns should help improve the lives of Cuban citizens in the immediate future. The biggest weakness of the Cuban revolutionary government, Foley said, is its lack of institutions allowing real workers’ democracy. That makes it difficult to deal with incipient bureaucratization and demoralization. And it has also led to a depoliticalization of Cuban society, despite the mass enthusiasm that the Cuban Revolution has inspired. In her antiwar report, Christine Marie pointed to the many positive opportunities to build a reinvigorated antiwar movement in this country—one that would be capable of building truly mass protests. The recent revolts in the Middle East and Northern Africa, she said, can aid the antiwar movement in gaining broad support. Jeff Mackler reported on the mid-February meeting in Europe of the International Committee (IC) of the Fourth International. The FI is the world socialist current (with sections in some 60 countries) with which Socialist Action maintains fraternal relations. Mackler reviewed Socialist Action’s perspectives on the major discussions and debates in the FI today. He focused on the need for the Fourth International to build mass Leninist parties deeply rooted in today’s unprecedented wave of general strikes and mass mobilizations, and in the emerging independent working-class councils and other fighting formations. Building mass Leninist parties at a time when the world capitalist crisis has brought millions into the streets to defend gains won in struggle decades ago, and in defense of fundamental democratic rights, is a prerequisite to forging a leadership capable of challenging capitalist prerogatives and chartering a course toward socialist revolution. Mackler presented a critical assessment of the FI’s present orientation to building vaguely defined “anti-capitalist” parties that lack clear revolutionary socialist perspectives. He criticized the tendency of these groupings to preference electoral alliances with non-revolutionary forces over united-front mass-action campaigns. Mackler stressed the need for the FI to correct serious errors in regard to working-class independence, wherein a number of FI sections (in Brazil, Mexico, and other countries) supported and joined electoral campaigns with multi-class, pro-capitalist formations. These policies had disastrous results. Daniel Adam noted in his organizational report that Socialist Action has grown steadily over the last few years, and increased its geographical spread—building new branches in Kentucky, Philadelphia, and elsewhere. SA is involved in a broad range of movement activities, and played a key role in helping to organize the United National Antiwar Committee. Socialist Action’s growth has been sparked by a new young generation of members, many of whom were elected to the incoming National Committee (the leadership body between conventions). Piper’s report, and discussion from delegates, laid great stress on bolstering the political and theoretical education of all SA members; for that purpose, a comprehensive set of educational bulletins was proposed. The convention approved a spring subscription drive for Socialist Action newspaper, beginning immediately and ending on May 1. The basic yearly rate for subscriptions will remain at $20, with a special introductory offer for new readers of $5 for five months. The convention also approved a $25,000 fund drive. This is necessitated by rising costs in our operations. 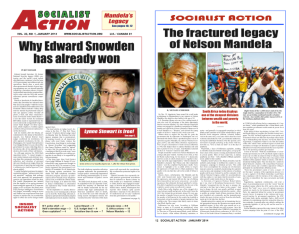 For example, printing and postage costs for Socialist Action newspaper have risen tremendously in recent months. It is hoped that our regular readers will all contribute to the drive. > This article was originally published in the March 2011 print edition of Socialist Action newspaper. Alexander Cockburn’s light is out at the end of the tunnel!